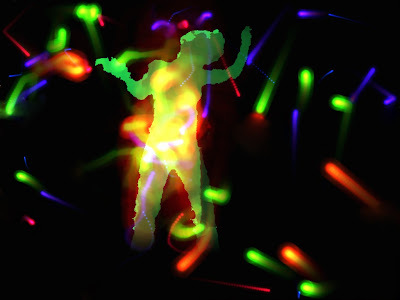 Get a Microsoft XBox Kinect camera and merge it with a computer particle simulation program and what do you get? A new project known as "Danceroom Spectroscopy". It's a fusion of art and science, resulting in a spectacular visual art show that is driven by laws of quantum physics. Danceroom Spectroscopy is an immersive art exhibition where dancers interact with the molecular world. 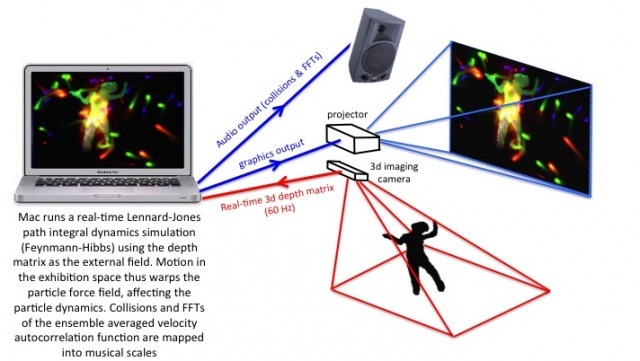 This interaction is projected on a large screen where their real time movements are interacting with computer generated particles that behave within the laws of physics. The Xbox Kinect camera serves as a real time infrared depth sensor. Hooked up to a particle simulation box which is running a certain kind of molecular-dynamics simulation based on so-called Feynman–Hibbs path integrals – an approach that approximates the quantum behaviour of systems. The movements of the person are translated in real time to either an attracting force or repulsive force that affects the simulated particles which is projected on a large screen. David Glowacki, a researcher at the University of Bristol in the UK is the main person behind this project. Glowacki says that so far the project has been warmly received by the general public and that it has also generated interest in both the artistic and scientific communities. He believes that the success of "Danceroom Spectroscopy" owes much to the balance it has struck between art and science, something that other projects have failed to achieve. "The golden mean is if [people] walk into something and if it's intuitive enough for them to get a feel for how it works, but there's also this kind of mystery behind it that they don't fully comprehend," he says.